The Benefits of Underground Infrastructure – Why Channel Utility Lines Underground? When it comes to the sheer number of houses that are located in your neighborhood alone, it’s easy to see just how many cables and pipelines would be required to provide everything from water and natural gas to internet connections and electricity to everyone who lives there. As a result, utility companies have long ago determined that driving utility lines underground is one of the best choices to make in terms of promoting the better use and organization of utility line layouts. So, you already know that when you turn your Smart TV on, your electric, cable and internet lines all get activated, and you get the power and signal necessary to use your TV set to watch your favorite shows. By going through an underground network, those utility lines are fully protected from bad weather and damage incurred, for example, when an animal chews on them. Moreover, the constant underground temperature and conditions will keep the cables from being affected by low or high temperatures, as well as altering humidity levels. 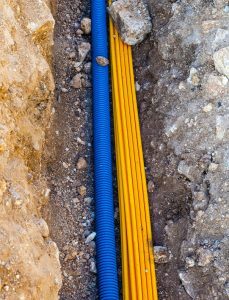 Finally, underground utilities can save a lot of space, and homeowners don’t have to worry about a powerful storm causing cables to break and fall on their properties, potentially leading to safety hazards. Because there are so many cables buried underground, it is imperative for your safety and uninterrupted utility services, that you utilize expert Colorado Springs utilities locations services before you dig.